Tak was first introduced in the second installment of The Kingkiller Chronicle, The Wise Man’s Fear, written by our guest of honor, Patrick Rothfuss, and later brought to life by designer James Ernest and published by Cheapass Games. It is a beautiful, elegant two-player abstract strategy game reminiscent of classics like Go and mancala. Cheapass Games has been a longtime friend and sponsor of our events and they have completely outdone themselves, sending us multiple copies of Tak to celebrate the occasion! Not only will there be demos of Tak throughout the night, you have a chance to win copies of Tak University Edition in our raffle, and our VIPs also receive a copy of Tak the Tavern Set. VIPs sit at the table with our Guests of Honor, Pat Rothfuss himself and game designer Gaby Weidling, in addition to receiving a whole host of other VIP perks. Tak has been hailed as a lovely elegant abstract game but if you are also in the mood to, say, burn down some villages and wreak some havoc, Cheapass Games will have you covered. From the Brothers Chaps and James Ernest comes Trogdor!! the Board Game. For centuries, the legendary wingaling dragon Trogdor the Burninator has terrorized the peasant kingdom of Peasantry with his scorching flames and greased-up beefy arm. Now, he has descended from the mountains once again and will not stop until he burninates the entire countryside and all those unfortunate enough to get in his way! Trogdor!! is a co-op puzzle, area control game where 2-6 players work together to help a beefy-armed dragon completely decimate a kingdom using unique powers and items all while avoiding knights and archers bent on stopping you. 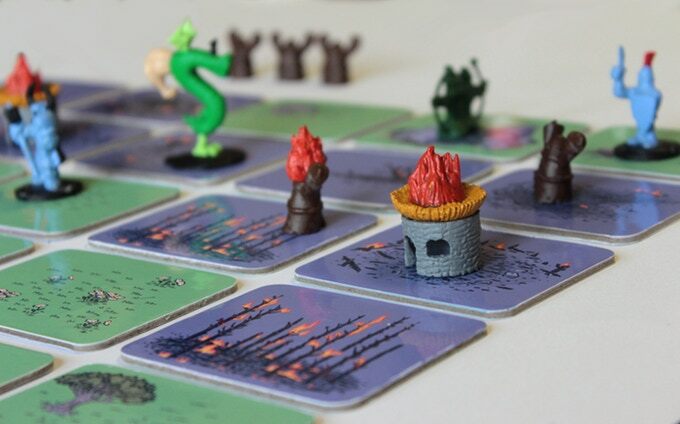 You and up to 5 friends -or maybe people you just paid to come over- take on the roles of a cult of hooded creepos calling themselves the Keepers of Trogdor who have devoted their lives to aiding the mighty dragon in his quest for total and complete burnination. Take turns guiding Trogdor on his destructive lost weekend around Peasantry. Help him avoid pesky knights and archers, devour peasants, burninate the countryside, and, of course, the thatched roof COTTAGES! !